There are two industry trends that we need to keep an eye on. First, the demand for faster data transfers continues to grow, and second, more reliance is being placed on cloud storage. Data center architects are constantly looking for ways to innovate and to implement solutions that address both of these trends. 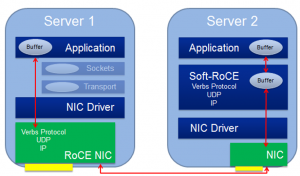 Serving as the counterpart to hardware-based RDMA over Converged Ethernet (RoCE) solutions is Soft-RoCE, a software implementation of the RDMA transport that offers unique advantages when deploying RDMA technology and meets the demand for efficient data movement. Soft-RoCE has a variety of real-world use cases. One of which is its ability to work with simple Ethernet adapters to connect servers to high performance storage units that utilize hardware-based RoCE. The hardware offloads utilized in RoCE-enabled storage appliances enables them to deliver data very efficiently; Soft-RoCE enables servers to attach to these appliances without a hardware upgrade, thus enabling data center managers to deploy the storage units quickly. The servers can then be powered by RoCE-enabled adapters during the next scheduled upgrade cycle. Soft-RoCE is an open source technology and has been made available in a GitHub community project with contributions from IBM, Mellanox and System Fabric Works. It can interoperate with Ethernet adapters that do not have hardware acceleration for RDMA, making RoCE available to everyone regardless of the hardware vendor.